This Primavera - Horizontal tapestry, is inspired from the work of artist Galileo Chini (1873 - 1956). 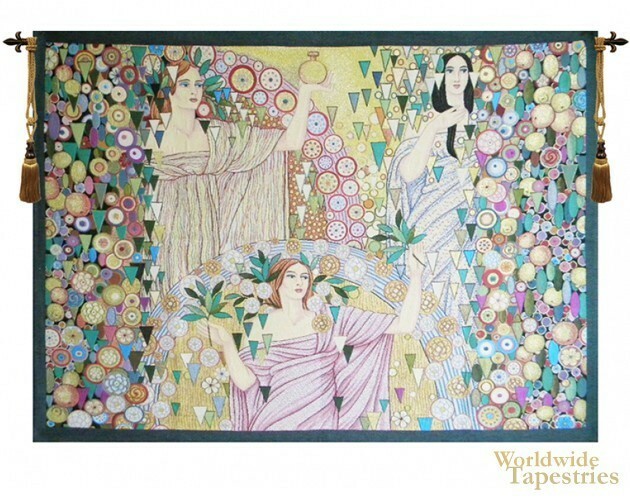 His works are in the Art Nouveau theme and is seen here with its unique use of pattern motifs and geometric effects. Here we see a personification of Spring, that is the representation of the renewal and life of springtime with women. The ladies are emerging from both natural leaf shapes as well as fantasy geometrical shapes, to create a most unique effect. This art tapestry is backed with a lining and a tunnel for easy hanging. Note: tapestry rods and tassels, where pictured, are not included in the price.